Huawei announced Huawei Nova 4 on Dec 17, 2018 in China. The 6.4-inch screen has a 2310 x 1080 pixel resolution, with a small punch hole on the top left which contains the selfie camera. The 172-gram body is made from glass and measures 7.77mm thick. A fingerprint sensor is set at the top center of the rear panel. Music is everywhere around us and people like listening music wherever they are. Here comes a question, how to filful your Huawei Nova 4 with music in a real quick time? Syncios Manager and Syncios Data Transfer are the best tool what you are looking for! Music album or single songs are all support to transfer. They can even sync iTunes music to Huawei without effort. Want to add some new downloaded songs to Huawei Nova 4? 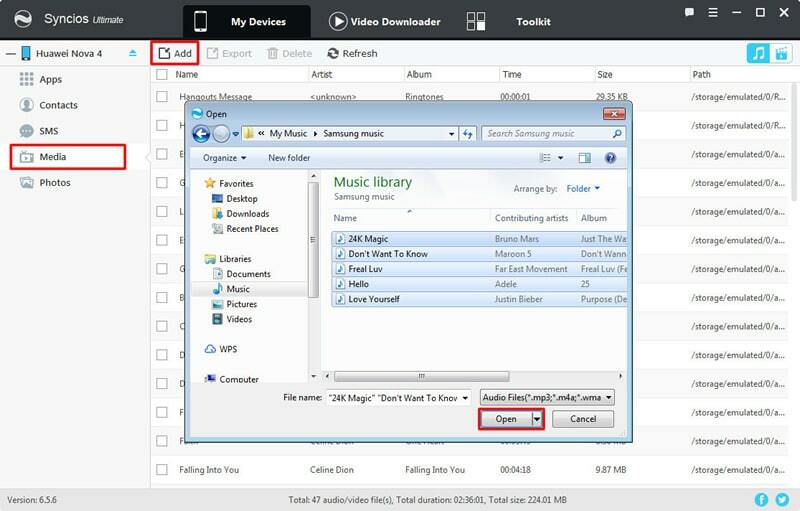 Syncios Manager support to import certain music folder or music file to your phone. You can also use Syncios Manager to make your own ringtone and set them on your Huawei Nova 4. Launch Syncios Manager on your computer first and connect Huawei Nova 4 to computer. After Syncios finish to sync your phone, click 'Media' option on the left side. All your songs of Huawei Nova 4 will list on the screen. Please click 'Add' button on the menu bar and choose 'Add File' option. Then you can choose desired music file and click 'Open' to import. You can transfer multiple songs at one time if you want. This time choose 'Add Folder' instead, and now you can select your willing music folder, click 'OK' to import. Syncios Data Transfer must be your best choice when you changing to a new phone. 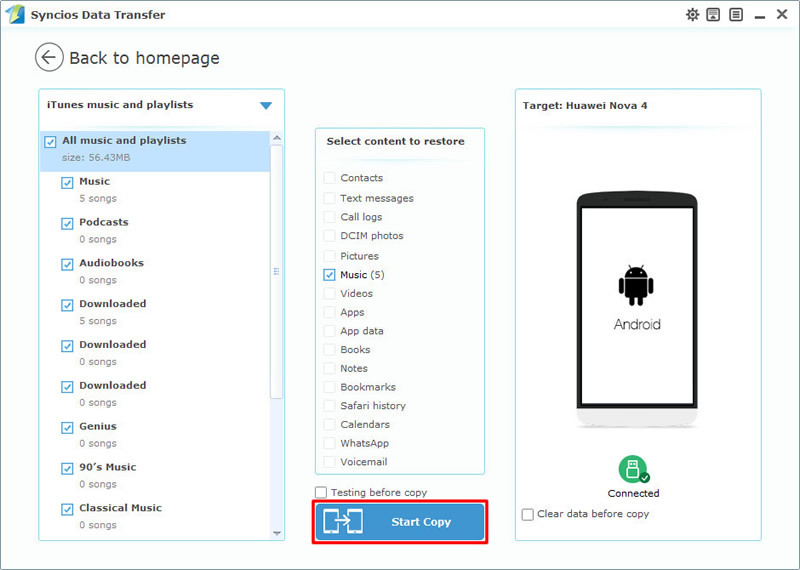 You might need to transfer all your music and other data from old device to new phone. Here, you just need 2 simply steps to switch all music from old phone to Huawei Nova 4. 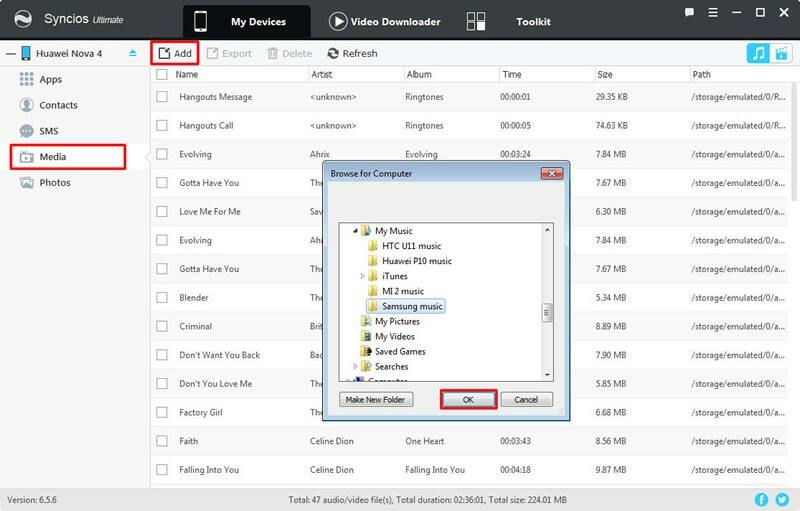 You don't need to worry of the duplicate songs, Syncios will detect it and skip the duplicate music. Meanwhile, you can use Syncios Data Transfer to sync iTunes playlist and library to your Huawei Nova 4. 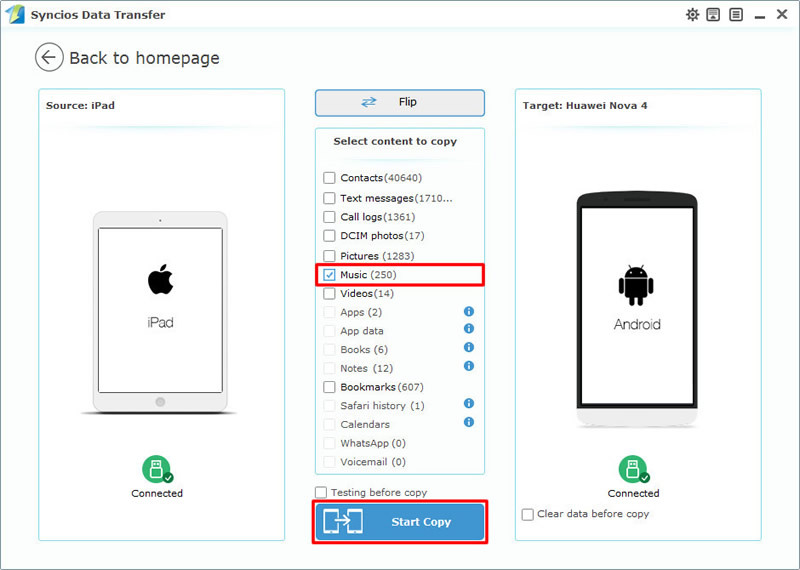 Launch Syncios Data Transfer and choose 'Phone to Phone Transfer' module at the first interface. Then you can connect your source device and Huawei Nova 4 to computer. Android or iOS device are all supported. Please noticed that your Huawei Nova 4 must on the RIGHT side and your source device on the LEFT. If they are not, you can click on 'Flip' to switch their positions. Wait for Syncios to sync your source device and click 'Music' option in the middle interface. Finally, click 'Start Copy' to launch. This time choose 'Restore Phone from iTunes' module and click 'from iTunes library' function. Connect your Huawei Nova 4 to computer. Syncios will detect your iTunes library and list then on the left side. Choose your desired playlist and library and click 'Start Copy' to launch. Tips: Encounter any detection problem during the process? please check Android / iOS for help. Please pay attention that only when Android phone and computer are access to the same network can Wi-Fi connection works.